Pixton is an online comic-generating tool which has education-specific account options. Teachers can devise assignments and then populate the account with students. 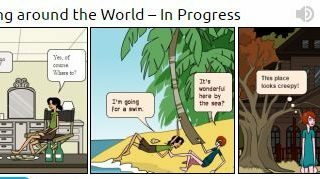 Students will then create comics within that Pixton account following the teacher's guidelines. Comics are lively and colourful and the options within the program are many from backgrounds to characters, movement, moods,etc.